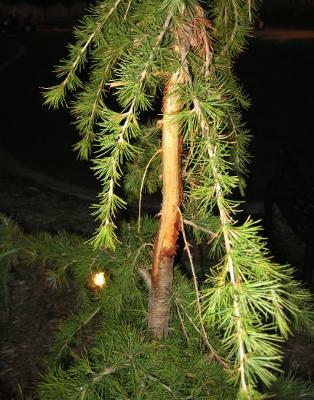 Deer have removed about 60% of the bark around a young deodora cedar tree that stretches for about a 12-16" segment. Of course they've pulled off several branches as well. Would you happen to have any suggestions on how to limit further damage the deer might try to do to several of our trees (pines, chokecherry, and burning bushes--all nibbled on, or worse)? I understand it's likely a waiting game now as to whether or not our deodora will make it, but is there a covering (burlap?) I could wrap the trunk with to protect the exposed segment during winter temperatures and snow in the Salt Lake valley and to discourage further attraction to the tree? I've been spraying a deer deterrent on our trees for about a week now and have not noticed new activity.